We love a good doughnut. A few of the sisters worked at our friends doughnut shop while in high school. We love these super soft baked doughnuts. The buttermilk and fresh strawberries makes for an amazing taste. And since they aren’t fried, go ahead and eat 2 without any guilt! 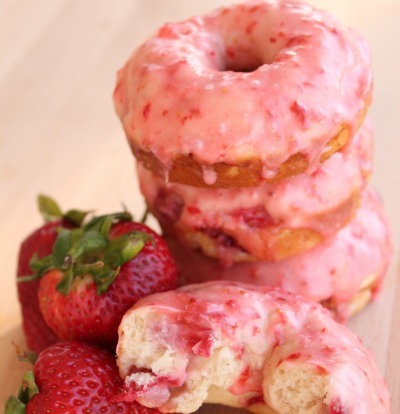 Easy baked doughnuts that are loaded with the delicious taste of strawberry! In a large bowl combine flour, sugar, baking powder, salt, and nutmeg. Mix until well blended. In another bowl combine the melted butter, eggs, buttermilk, vanilla, and strawberry jam. Add the wet ingredients with the dry ingredients. Mix until combined, then fold in diced strawberries. Carefully spoon mixture into doughnut pans, filling 3/4 full. Bake for 7 to 9 minutes or until toothpick inserted comes out clean. Cool on a wire rack. Then make the glaze while the doughnuts are cooling. Mix strawberries, whipping cream, and jam until blended. Then add powdered sugar and beat until smooth. Add more powdered sugar if you need to thicken the glaze more.You can drizzle the glaze over the doughnuts, or dip them into the glaze. We still had glaze left over, so we dipped them a second time after the first layer of glaze set up for a few minutes. Eat right away because these doughnuts are soooooo delicious! Do you think they would be just as good with blueberries??? What if I don't have a doughnut pan? Are you supposed to whip the cream before it goes into the glaze? You do not whip the cream, just add it into the glaze. Could you use thawed out frozen strawberries? It is hard in my part of the country to get good fresh strawberries. It should work. Frozen strawberries are pretty gooey when thawed. Try to get as much moisture off of them as possible. What kind of flour works best? We use bleached all purpose flour. Sometimes we use Gold Medal flour, or even the store brand flour works great.